Although Worldwide Experience started in 2002, the story goes back much further than that, beginning with the Gardiner family in 1990. Adrian Gardiner, a prominent businessman in the coastal city of Port Elizabeth in South Africa, bought a farm of 1200 hectares as family weekend getaway. Upon researching the history of the farm, Adrian Gardiner soon realized that, despite the lack of game in the area at the time, the Eastern Cape used to be one of the richest wildlife areas in Africa in terms of biodiversity! In fact, the legendary big 5 were first encountered in the Eastern Cape. Wildlife historians refer to the Cape Buffalo, Cape Leopard, Cape Lion and Cape Hunting Dog (African Wild Dog) in their historical documents. The endangered Black Rhino flourished in the Eastern Cape. However, due to hunting, over-farming and drought most of these species were eliminated during the 19th century. Adrian’s vision to restore the area to its former glory was born, and through much dedication started to materialize in 1992 with the birth of Shamwari Game Reserve. During the past twenty five years, 25, 000 ha of pristine and agricultural land was consolidated and rehabilitated. Remaining wild animal species were allowed to increase in numbers and species extinct to the region were reintroduced. Adrian Gardiner sold the game reserve in 2008, however he kept his own adjacent private property with traversing rights throughout the reserve. In addition to the boutique luxury Founders Lodge, the property serves as a base for further conservation projects, ideas and gatherings around conservation initiatives, of which the Worldwide Experience team is much involved. Further properties were added to the Shamwari group, and in 2000, the Mantis Collection was founded by the Gardiner family, growing into a collection of award winning, privately owned, five star properties located around the World. Mantis is committed to the spirit of conservation and restoration, and each property is sensitive to its surroundings in respect of the building, environment and local community. More than just a hotel group, Mantis has several unique divisions including Management, Marketing, Development, Conservation and Education! Mantis is also the only hotel group with a presence on all seven continents. 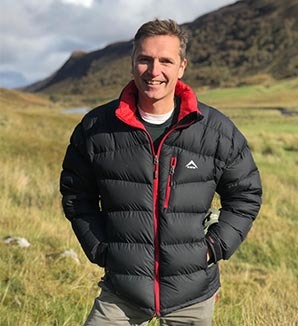 Paul Gardiner – founder of WorldWide Experience. Two years after the Mantis Collection was founded, Worldwide Experience was founded by one of Adrian’s sons, Paul Gardiner in 2002. It is no surprise that Paul’s heart is very much in conservation, and along with his family has shown dedication particularly to rhino conservation. Paul joined the Mantis Collection in 1998 in a marketing capacity. After four years in the business he headed up the Group Sales & Marketing department, and in 2002 he departed for the United Kingdom. He continued in this role and also became the MD of Southern Africa Travel, a UK based Tour Operator and set up Worldwide Experience in the same year. with a major player in the theme park space. Paul’s latest venture is Mantis Media and the focus of this company is on television and film production, location based entertainment, and working with and developing new talent from across the globe. Paul is now the Group Marketing Director of Mantis Collection and he continues in his capacity as managing director for Worldwide Experience, and works very closely with his father, Adrian Gardiner, as they strive to grow their hotel portfolio throughout Africa and beyond. 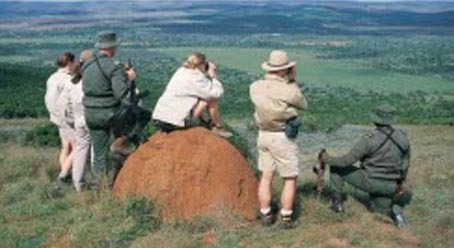 Worldwide Experience, initially called Eco Africa Experience, developed a conservation volunteer programme on the reserve in response to demand. It was this demand that drove the inspiration and commitment to developing a safe, supervised and structured programme delivered by professionals, for students and volunteers where they could not only learn about wildlife and conservation, but gain hands-on experience in the field, allowing them to make a difference to the natural ecosystems and surrounding communities. Interestingly, the Eco Africa Experience brand was revived in 2012 as the conservation project development arm of Mantis Education. 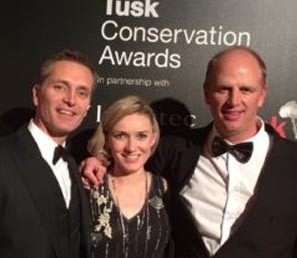 Paul and Abigail Gardiner with Dr William Fowlds at the 2016 TUSK awards. willing, self-funded volunteers. Individuals and groups that have travelled with us over the past 15 years include school groups, gap year students, those on a year out or a sabbatical, university students and university groups, as well as veterinary students. In 2008 Worldwide Experience introduced a programme specially designed for veterinary students from all over the globe. ʻVets Go Wild!ʼ is a module tailored to vet students who seek to fulfill the ever-important Extra Mural Study requirements. This conservation-based module runs over two durations, a 16-day or 12-day period, and is coordinated by top South African Wildlife vet Dr William Fowlds from Amakhala Game Reserve. Our relationships with the several UK and African charities we support continue to flourish and the proceeds from all volunteers are allocated to the charities, including the Born Free Foundation, the Wilderness Foundation, Tusk, Helping Rhinos, Greenpop and Save the Rhino. Our portfolio of projects which require our support has expanded around the globe will continue to evolve according to local needs. impressive conservation-related qualifications and experience in the field on game reserves and with student and volunteer projects. Our head office is in Godalming, Surrey, with our operations office in Port Elizabeth, South Africa. Our portfolio has expanded to encompass the following categories:. If exposure to the African wildlife is your dream – perhaps even interacting one on one with wildlife – then gap year voluntary work at one our Wildlife Sanctuary projects will exceed your wildest expectations, as you help provide care for wildlife animals that are injured or that have unfortunately come into conflict with humans.